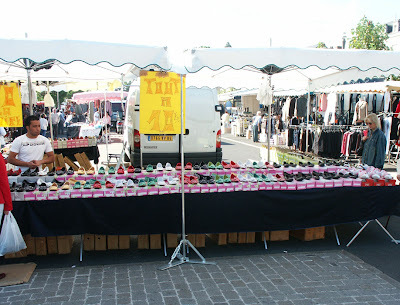 When I was in Chatellerault arranging to have the phone connected there was a market in the main square. For some reason, the colours on this stall really interested me. I know the polka dots (and the prices) interest Susan. Chatellerault is an interesting town. Like many French towns it is approached through the industrial area and this gives no indication at all of what the town itself is like. (I know that most towns the world over are approached through industrial areas, but this feels different. Maybe it's growing up in Canberra). The town itself is built around a really quite wide and long square and has cafe's and fountains and stuff. We haven't really ever been to the town itself, mainly the station and hardware stores, of which it has many. 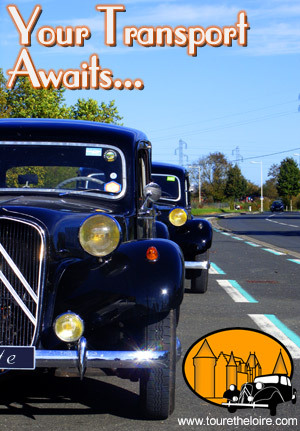 We will probably spend a day in Chatellerault this Christmas putting this right. 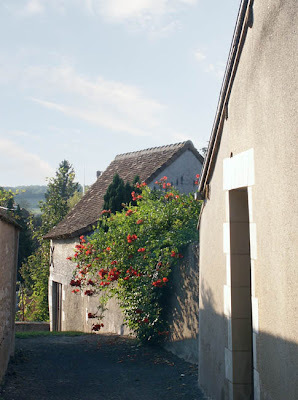 In a previous entry I wrote a little about the Abbaye Saint Pierre. This is the western front. It is here that the church really showns its Romaine origins. To English speakers, for Romaine read Romanesque. If we were talking about a church in England it would probably be described as "Early Norman". This photo was taken without flash or a tripod. Lamp posts are really useful sometimes. 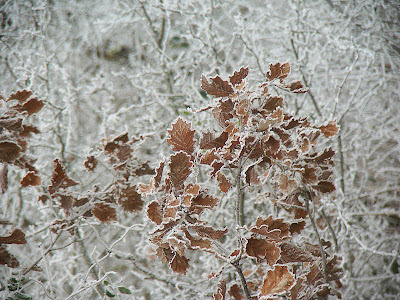 So - another summer over, and according to the meteo, it's been cold in Preuilly. I was rather purturbed to see that the temperature has been down as low as -3c, especially as we had left the water turned on at the house so that the roofers could finish their magic. The thought of burst pipes was too much, even though most, if not all, of the pipes will probably have to be replaced. Luckily, we have recived an email from Alan and Jane, who live in Preuilly. A quick pleading email and Alan was down checking that the stopcock was off and the tap outside on the back of the house was open. It appears that either the roofers or our neighbours were on the ball and this had been done, but it's a huge relief to have confirmation of this. We have recently received a number of emails from people who know the area in and around Preuilly. Some of these people are English, and either live there permanently, or have property there that they visit for extended periods, but we have also received email from French people who live in Preuilly. It seems a bit soon to have become celebrities (no matter how minor) in our new town, but apparently there are a number of people who like what we are doing - so that's nice! 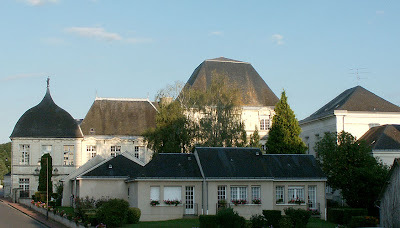 Preuilly has more than one chateau. 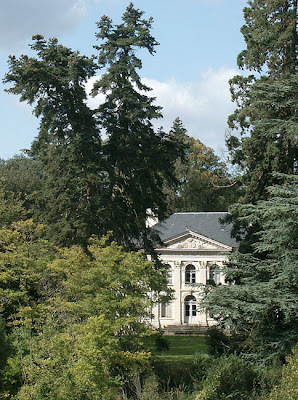 In this case, though, the chateau is of the manor house persuasion rather than a castle. 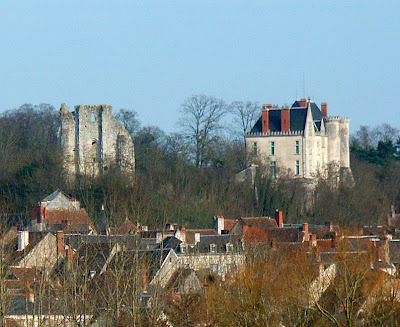 Fontbaudry is just north of Preuilly on the road to Loches. The current building dates to 1845, but there has been a defensive manor on the site from the middle ages. Amazingly ( if I am reading my sources correctly) a tower from the medieval building survived as a dovecote until the 1980s, when it was "ploughed in". From the front the building looks pretty much standard classical revival style. In winter, however, you can see the building from the side, when it takes on a more sprawling aspect. 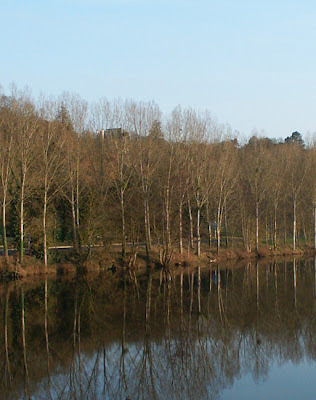 Bonneuil-Matours is where the road from Preuilly to Poitiers crosses the Vienne river. There is a photo of the bridge here. 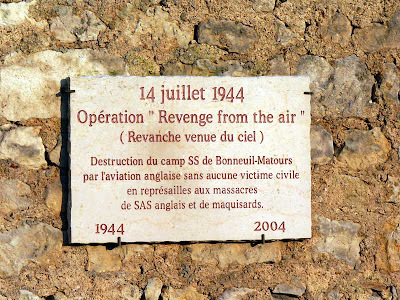 Operation "Revenge from the air"
Destruction of the SS camp of Bonneuil-Matours by the English aircraft without civilian victims in reprisal for the massacre of English SAS and Resistance fighters. The SAS had a base behind German lines in France immediately after D-Day in the forest near Verrières, South-east of Poitiers. On the 3rd of July the base was surrounded and the SAS soldiers shot after capture, along with a number of local men. 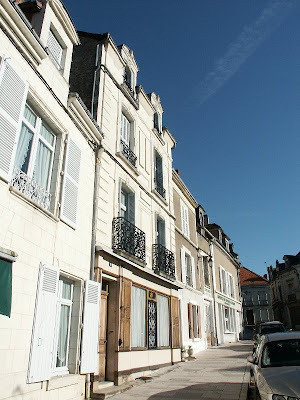 There is a Rue du 3 Juillet 1944 in Verrières. For about a year I have assumed that the building bombed was the school on which the plaque is mounted. However, I have done a little research and it now appears that the target was the Château de Marieville, which can just be seen on the skyline in this photo. From what I have since discovered, the Aircraft involved were Mosquitos of 464 (RAAF), 487 (RNZAF) and 21 (RAF) Squadrons. These are the same squadrons involved in the famous "Operation Jericho" (the bombing of the Prison in Amiens), and the even more famous raids on the Gestapo headquarters in Aarhus and Copenhagen. There is a report on the raid (in French) here. 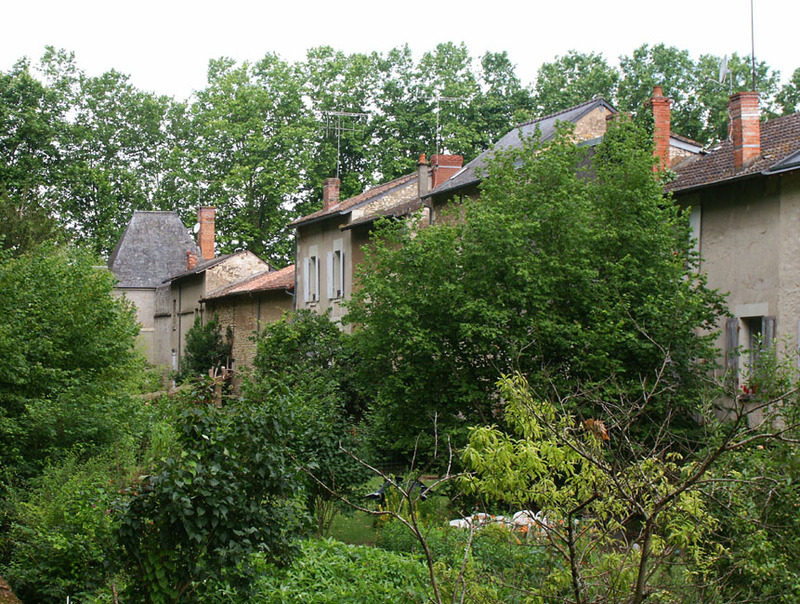 The ruin on the left of this photo is what remains of the chapel of Saint-Melaine. It was built in the 12th Century to replace an earlier chapel (circa 851), and "devastated" in 1562 by the protestants. (I'm sorry, but I can't give any more information on this devastation until my French reading skills are better). The decorated column capitals were sold when the Chateau was restored at the beginning of the 20th Century and are now in the Cleveland Museum of Art. They can be seen here. The Eurostar has commenced running from St Pancras in London. It now runs right past our house in London, so to celebrate, a video of a train. 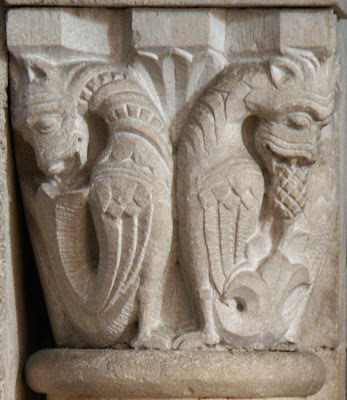 A carved capital fro the church of St Savin. It's more famous for the paintings, but it's always worth looking at the carving in old churches. I have no idea what it is, or what it means. I will have to buy a book on iconography - once I find one that I understand. And a bathroom with hot water. This is a view of the Eastern End of the Abbaye. 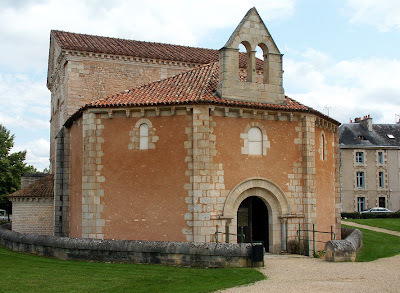 According to John James on his blog, Preuilly had the "first great rose window - 1160s" but I think this must refer to another Preuilly - certainly there is no evidence of a rose window in the Abbaye in Preuilly-sur-Claise. If there was you would be able to see it in this pic. The Abbaye was founded in the year 1001, and in 1012 a monastry was founded. The date over the door is 1009 (the year of consecration) and the 900th year anniversary of the Abbaye was celebrated in 1909. This means the 1000th birthday of the building will be celebrated in 2009. I wonder if they will have cake? 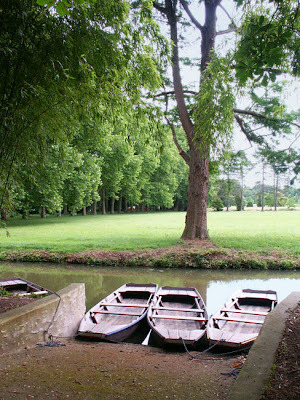 As mentioned in aprevious entry, there are boats available for hire in the gardens of Richelieu's chateau. I have a feeling this we will have to do this one day - punting on the moat anyone? We have been really quite surprised by Poitiers. As you drive towards the town from Preuilly, it looks really unprepossessing - all you see is a power sub-station and what looks like a series of tower blocks built on a hill. Once you cross the river (the Clain) you are left in no doubt this is an old city - narrow streets, old buildings, and a lot of very old churches. Notre Dame le Grande is in the middle of town, opposite the Palais de Justice. The present church owes a lot to Eleanor of Aquitaine in the 11th century, but there are records of an earlier church on the same site. 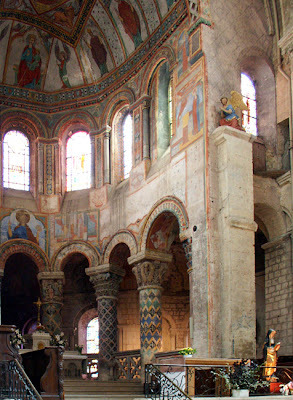 The interior of the church is highly decorated with frescoes and memorials. This memorial really interested Susan. Such a fashionable group of people! There is another picture of this church here. 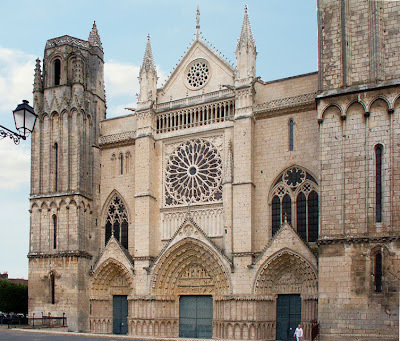 The cathedral in Poitiers was also started under the orders of Eleanor of Aquitaine. It has 13th century carved wooden choir stalls, some important stained glass, and a late 18th century organ. 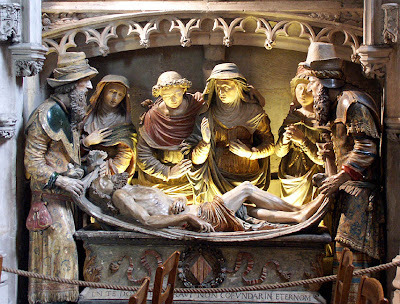 This church incorporates the 6th century tomb of St Radegonde, the founder of the first convent in France. 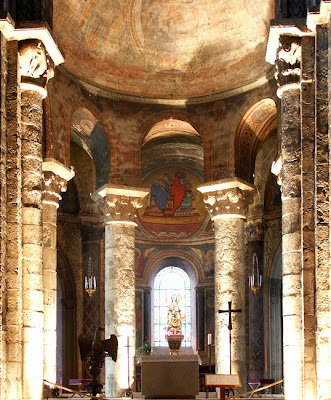 This is another highly decorated church, with frescoes and ancient stained glass. 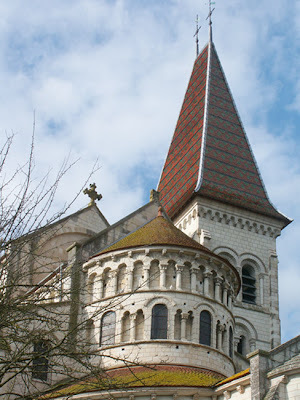 There are other places of interest in Poitiers, including the baptistry and a rather good looking (if not terribly attractive) market. Part of the "having the roof replaced" exercise involved having the chimneys demolished. 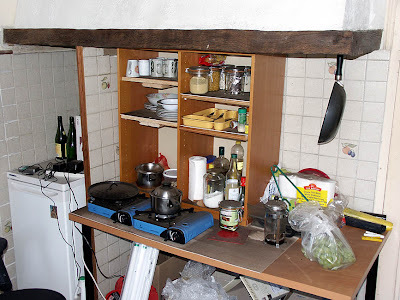 The chimney over the kitchen will one day contain the pipework for the hob fan, but at the moment it is a grimy, greasy, soot laden hole into the kitchen down which stuff can fall. The top of the chimney was demolished while I was out, causing all the sooty grease (probably a couple of hundred years worth) to fall into the kitchen. It took 6 hours (and a bottle of gas*) to clean. * We don't have hot water in the house. To get hot water we have to heat it on a gas stove. 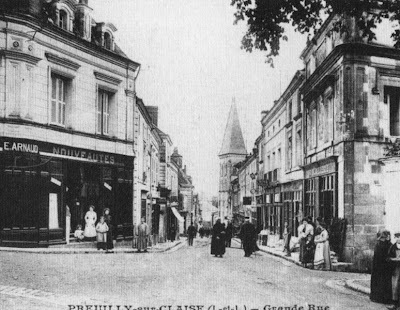 The market town of Richelieu is about an hour away from Preuilly sur Claise. 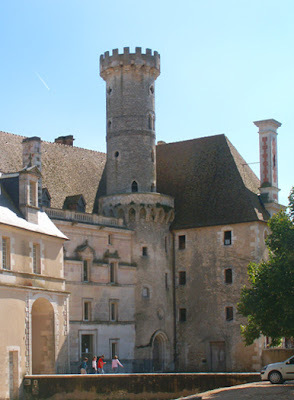 It is a planned town designed for Cardinal Richelieu by Jacques Lemercier. 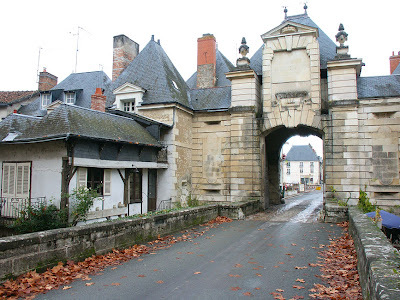 Cardinal Richelieu bought the village of his ancestors (nice to have money.....) then obtained the authorization to build "a closed wall borough and ditches and to build a market" from Louis XIII. 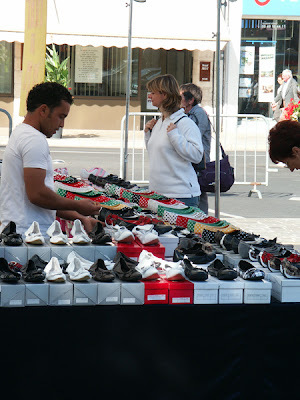 Approval was also given to hold four annual fairs and two markets per week. The town was built between 1631 and 1642, then building stopped, mainly due to the Cardinal's death. The design is Hippodamian (look it up!) and laid out on a symmetrical grid of 500 x 700 metres. The plan is centred around 2 squares: la Place Royale, and la Place du Cardinal on which is the town hall and a covered market. It is surrounded by walls (made up out of the back walls of the outer ring of houses) and and a moat (now mainly grassed over). There are three monumental gates, with a fourth, ornamental gate, built to maintain symmetry. The rules for building in Richelieu were very strict - the purchasers of land had to commit to building there within 2 two years, and the house had to be built according to plans held at the clerk's office. Furthermore, anyone building had a choice between only 2 builders who were authorised to carry out building work. A register still exists which shows the list of the owners and all the works involved in building the town (and presumably which of the builders they chose). On the main street there are still 28 of the identical hotels (mansions) built under the plan and these are the grandest of houses, presumably for the grandest of people. One is open for visits, so one day we will have to do that. On the streets behind them there are smaller houses on smaller plots of land, also built to the masterplan. Further out against the town walls are the workshops, factories and some of the less salubrious businesses such as butcheries, but even these are to the plan. 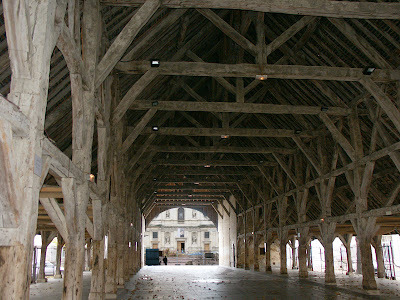 The original market hall still exists, and is a huge oak and sycamore building which has been well maintained, but never really imporoved or renovated. 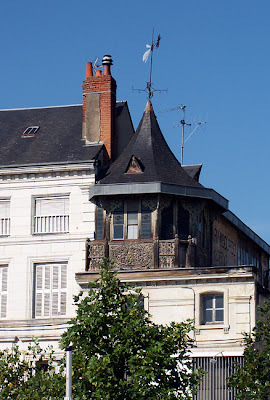 This gives a real idea of the effort that went in to making Richelieu the most modern and comfortable of towns. Like many planned towns (even today) it was anticipated that they would have problems attracting residents and businesses, so the cardinal exempted the town from tax. Outside the walls, the Cardinal built his palace, which was intended to be the largest in France. Most of the stone came from the Chateau at Saumur (which is why large parts of the ramparts of Saumur are being rebuilt, one assumes). 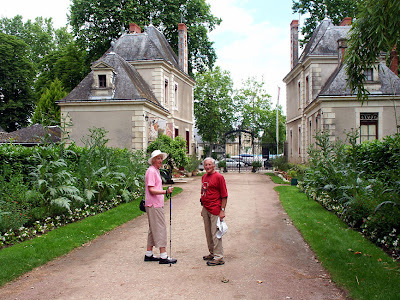 The chateau no longer exists, but the gardens are still there, and you can hire bikes to ride them, or boats to explore the ornamental waterways. My parents in the Cardinal's gardens. A arial photo of Richelieu can be seen here. 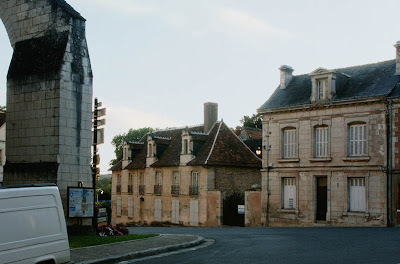 I previously posted an entry about Jean Dufy, showing his painting Place de l'Abbaye. I have taken a photo from about the same place. I even took it at about the same time of day, judging from the colour of the sky in the painting. Unfortunately, the sunset wasn't quite as glorious on the day I took my photo. 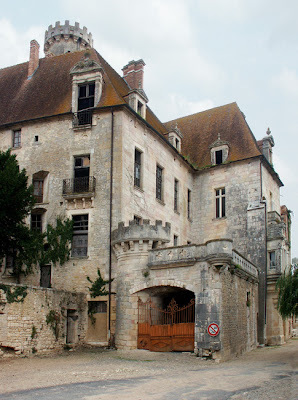 The Hotel de Rallière is an unfinished chateau dating from the 17th century. It was built for Samuel Gaudon, a native of Preuilly, who made a fortune from farming and needed a new home to reflect his rise in status. He was imprisoned in the Bastille for his religious beliefs (he was Protestant) in January 1649, which bought the building program to a rapid end. It has been used at various times as a prison, girls school and retirement home, but has been empty since 1992, when the new retirement home was built. The area around Preuilly, with its mosaic of habitats, abounds with butterflies. The best butterfly spots are the flowery chalk grasslands, the heaths and the woodland glades. There are about 125 species of butterfly in France (compared to about 60 in Britain and 420 in Australia). I have recently purchased Les Papillons de jour de France, Belgique et Luxembourg et leurs chenilles by Tristan Lanfranchis, and a quick trawl through this excellent volume reveals that in Indre et Loire we could expect to get 94 species. Of those, 18 are species for which our départment is clearly a refuge, as they are extinct in the surrounding départments. Only 2 species have gone extinct in Indre et Loire, and there are another 8 rare species that it might be possible for us to get occasionally. 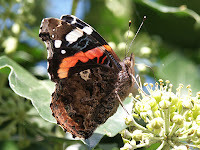 Red Admiral Vanessa atalanta (in French le Vulcain ie the Roman god of fire). These can be seen anywhere at any time of year, but are particularly noticeable in the autumn coming to the ivy flowers on sunny days. Painted Lady V cardui (in French la Belle-Dame ie the Beautiful Lady). 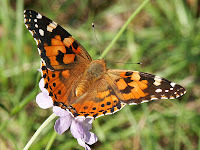 This species is cosmopolitan, and very similar to the Australian Painted Lady V kershawii. The French Painted Ladies are well known for migrating to England in large numbers most years, presumably to provide an element of bon gout to the English countryside. 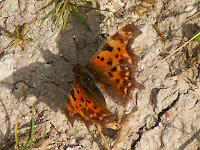 Comma Polygonia c-album (in French le Robert-le-Diable ie Robert the Devil). Robert le Diable is a vicious and cruel character in a French medieval tale. In the story he undergoes an epiphany and performs many acts of penitance. The name has become associated with Duke Robert of Normandy, father of William the Conqueror. I have no idea what the association between Robert le Diable and the butterfly is though. The English name refers to a feature that you mostly will not even notice - a tiny silver comma shaped mark on the underwing. Fortunately, this is a distinctive butterfly, easily identifiable by its deeply scalloped wing margins. Often to be found sunning itself on bare ground, and quite obligingly easy to photograph in this situation. This one is near le Chameau at Chaumussay. Le Chameau is supposedly the most beautiful natural rock formation in all of the Touraine - I'm afraid it doesn't say much for the others if it is true. Le Chameau does provide an amusing fountain head for la source St Marc though, and the box (Buxus) covered hillside above is an orchid hotspot. 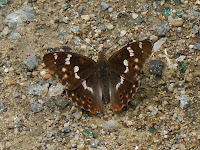 Lesser Purple Emperor Apatura ilia (in French le Petit Mars changeant ie the small changeable Roman god of war). 'Changeant' refers to the way the irridescent blue of the males upperside changes with movement and light conditions. This one is female. The species can be distinguished from lookalikes by the yellow tips to the antennae. These are surprisingly obvious, but curiously none of my books mention the feature. This species does not occur in Britain. 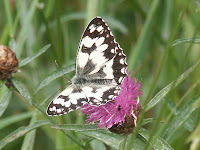 Marbled White Melanargia galathea (in French le Demi-deuil ie the Half-Mourning). The French name smacks of the 19th century, and presumably refers to the fact that the butterfly is only half black (half mourning dress was usually grey or pale lavender - subdued and respectful but not as gloom-ridden as black. You switched to half morning at some suitably discreet time after the death of a loved one to indicate that you were no longer paralysed by grief and were returning to society and could be invited to parties, so long as they weren't too much fun. Queen Victoria famously never managed the transition into half mourning.) These butterflies are very much a species of flowery chalk grassland. Adonis Blue Lysandra bellargus (in French le Bel-Argus or l'Azuré bleu-céleste ie the Heavenly Blue, with two different words for blue, just to make sure you understand how very blue it is). Argus was a 100 eyed monster in Greek mythology and his name is often applied to butterflies - I suppose because they very often have a pattern of 'eyes'. These are another species of chalk grasslands and certainly are 'heavenly blue'. They are quite large as Lycaenid (ie blue) butterflies go and utterly, stunningly beautiful with their intensely blue uppersides. These were photographed, with some frustration at their reluctance to sit with open wings, at the utterly, stunningly beautiful Angles sur l'Anglin. Silver-washed Fritillary Argynnis phaphia (in French Le Tabac d'Espagne ie the Spanish Tobacco). 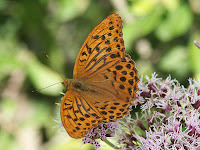 A large and common Fritillary, often seen at flowers such as Hemp Agrimony on the river bank. This one is a male, distinguishable by the heavy dark radiating lines on the upper wing. 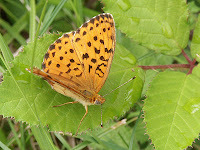 Marbled Fritillary Brenthis daphne (in French le Nacré de la ronce ie the Lustre on the Bramble). 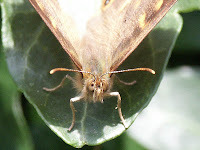 This one was photographed on the edge of a heathy wood, sitting on a bramble leaf. It was extremely unobliging - nervous and difficult to get a good shot of. There was a lot of cow wheat in the vicinity, which is the host plant for a number of Fritillaries - but not this one. This one's catepillars eat Brambles Rubus spp (Woolly Blackberry/Ronce cendrée, European Blackberry/Mure, Elm-leafed Blackberry). 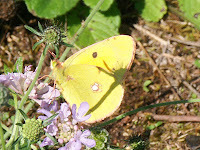 Clouded Yellow Colias crocea (in French le Souci ie the Marigold). Another grassland species, and another that can come trooping over from France to Britain in good years. I love the touches of pink - very frivolous. 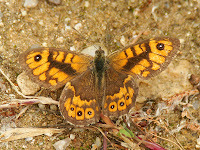 Wall Lasiommata megera (this is a male, so in French he is le Satyre - the Satyr. Females are called les Mégères - Shrews!) This one was photographed at la Réserve Naturelle de Chérine, in la Brenne and owned by la Ligue pour le Protéction des Oiseaux (LPO). I think the rather curious English name must come from the species having a liking for sunning itself on walls. 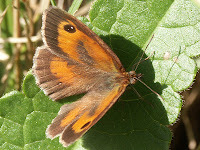 Gatekeeper Pyronia tithonus (in French l'Amaryllis - no idea why). This species is very much associated with hedgerows and undisturbed gardens. Also photographed at la Réserve Naturelle de Chérine. This one is male. 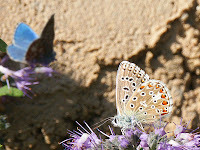 BTW, did I mention how amazingly blue Adonis Blue's are? 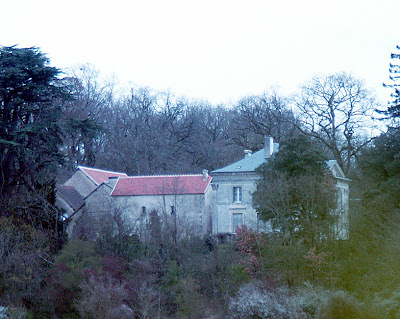 The Chateau at Le Grand Pressigny is closed this year, and will re-open in 2008. At the moment it is a building site. 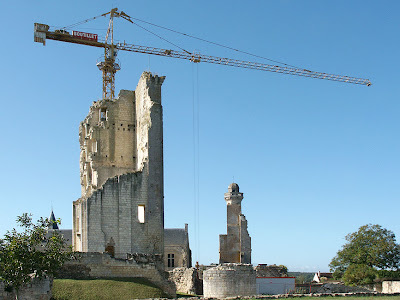 Although it looks like they are intent on rebuilding the whole chateau (a la Saumur), they are actually building a new extension to the Archeological Museum. 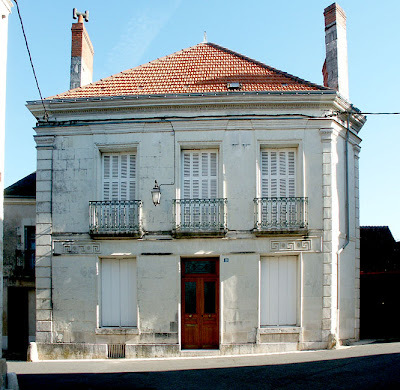 The museum is well worth visiting, as le Grand Pressigny was the hub of a large stone tool manufacturing industry. One of the things that was most important to us when looking for our new home was that it should have a garden. The other was that it shouldn't need a new roof. 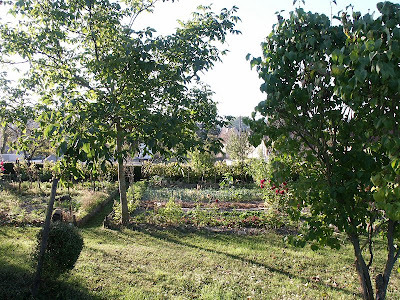 Although the house does have a garden, it isn't big enough to grow all the fruit and vegetables we want, so we always knew we would be looking for a potager - an allotment, or kitchen garden. These can be rented for not a lot of money and are often works of art. 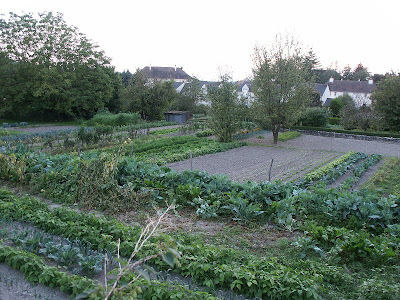 Although the French appear to have difficulty with doing lawns and borders, they do know veggie gardens. 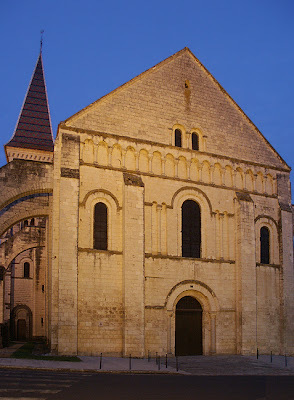 The Baptistery of St John in Poitiers is claimed to be the oldest existing Christian building in France. Built in about 360 but much altered, it is worth half an hour (at least) of anybody's time. Two photos of almost the same view, taken 98 years apart. To get exactly the same viewpoint would involve standing right in the middle of a main road, something I might do one day. Maybe I need to wait until summer 2010 and take exactly the same view 100 years apart. Until then, this is the closest I can get. An occasional series. 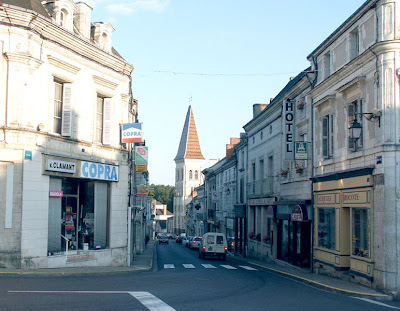 These aren't pictures of special streets, or even necessarily of pretty streets, but to give a flavour of the ordinary every day views and scenes of Preuilly life. These houses are not at recent as they look. Although the facades date from the late 17th to early 19th century, most of the houses date from about 200 years earlier. There isn't much information available about Preuilly's history, but most sources appear to agree on this as a fact.